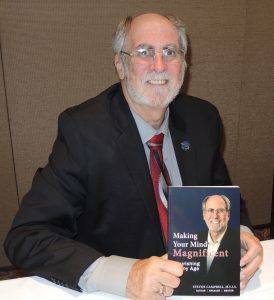 Come meet the man who left the corporate world as Vice President of Marketing for General Foods and who was on the team that invented Jell-O Jigglers, to become an internationally acclaimed and award-winning poet and former Chairman of the National Endowment for the Arts. 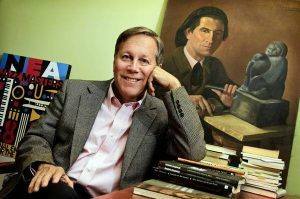 Dana Gioia (pronounced JOY-uh) will be our speaker on August 3rd. Christine Schieberl from the Santa Rosa West club was in attendance today. Today’s guests included: Mary Page from the Foundation for Global Humanity, Barbara Hofmann from Mozambique, Mike Mullins from Empire Law School, Justin Pigeon and Peter Holewinski’s son, Aron visiting from New York. Also present was our Rotary Foreign Exchange outbound student, Christopher Gullixson whose next stop is Sweden. Robby Fouts again presented today’s raffle. This writer didn’t catch who won the drawing for the money, but Layne Bowen won two fair tickets after having his number called. Ginny Cannon announced that Cathy Vicini is recovering from her recent surgery but is not quite ready to attend Rotary. 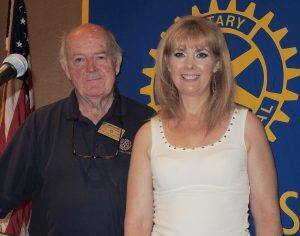 Rotarian Jack Geary presented a Blue Badge to his daughter Andrea Geary. 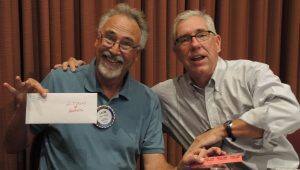 Two generations of Rotarians in the same club! El Presidente Jose awarded a blue badge to Andrea Geary and acknowledged her immediate contributions to our club including her running the Bocce Tournament and participation on other committees and events. He then auctioned off two tickets to this Sunday’s Giants/ Nationals game at AT&T Park that were provided by Diane Moresi. PP Bill Rousseau won after a heated auction for $125. District Conference 5/12-5/14 Hyatt Regency, Lake Tahoe (www.rotary5130.com). Register early to get good rates. RI Convention in Atlanta Georgia, June 10-14, 2017-100th Celebration. 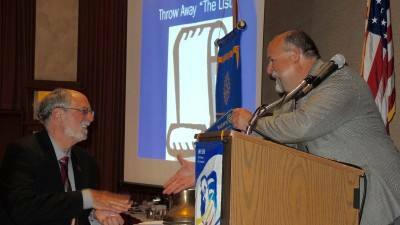 Let’s try to get a large group going to the convention and be eligible for an award from the District Governor. Sad to see two members leave our club-Joy Parker and Steven Dunn. Mark Burchill asked if anyone has a video 8 player as he is converting video of Rotary events to a more modern format. Not surprisingly, Robby Fouts still owns one! 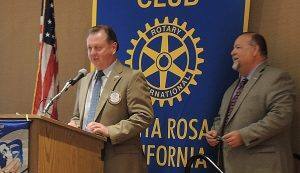 Matt Fannin announced there will be a membership meeting after next week’s luncheon. Yale Abrams asked for volunteers for a hands on project on Saturday, September 24th. 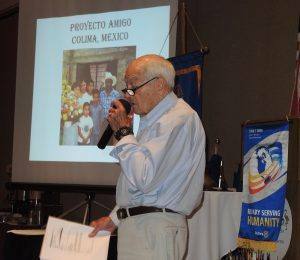 Rotarian Will Haymaker highlighting Project Amigo. One of our very important committees! El Presidente, Jose will be asking each committee to give a presentation to discuss what they are doing on the committee level. Today, with his usual “Aloha!” greeting, past president and aspiring hula dancer Will Haymaker shared information about the legacy project supported by our World Community Service Committee, Project Amigo. Project Amigo has long been supported by our club. The project is based in Colima, Mexico and is an education program for children who would otherwise have extremely limited access to education. Project Amigo has supported children from kindergarten through college and beyond including one young woman who is now studying to be a surgeon. Club members are encouraged to, as Will said, “Get off your butts and go down and work for a week”. 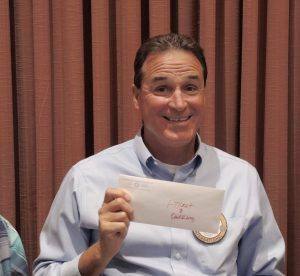 President Jose and Rotarian Jackie McMillian – Jose presented this cone to Don McMillian – absent today. 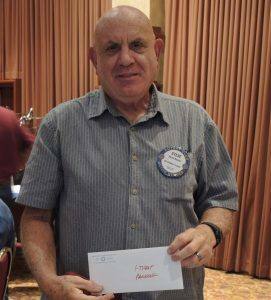 El Presidente,Jose took a few minutes to acknowledge a few Rotarians. Dr. Shari Shamsavari was recognized for giving Giro Bello shirts to the children’s Mariachi Orchestra in Guadalajara. Diane Moresi was recognized for her skill at locking her car keys inside her car the day of Giro Bello in an age where it’s almost impossible to do so. For this, Diane was awarded an East LA car key (a coat hanger) by El Presidente Jose. PE Julia Parranto was recognized for her lavish Hawaiian vacation for which she donated $100 to daughter Andrea’s Paul Harris. 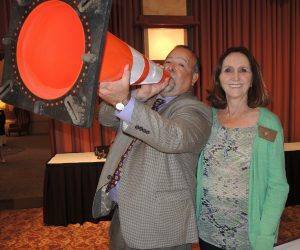 Don McMillan was awarded a traffic cone in absentia for his work running Giro Bello. From which country does El Presidente Jose hail?